A one seed Juniper perfectly frames Gateway rock in Colorado Springs Garden of the Gods Park. 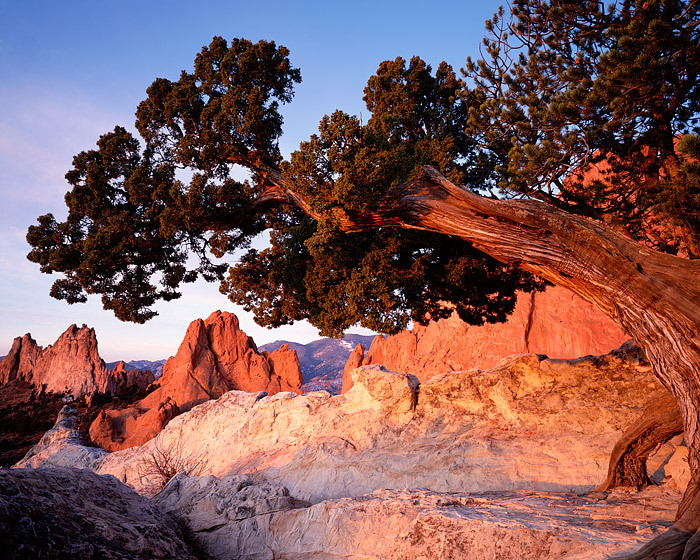 These beautiful Juniper trees can be found all along the ridgelines at Garden of the Gods. Garden of the Gods is a great location to photograph the many rock formations as well as Pikes Peak and the Kissing Camel formations. Garden of the Gods which is located in Colorado's Front Range, just outside of Colorado Springs, is reminiscent of Utah's famed red rock canyon country. Photo © copyright by Thomas Mangan.